Comes with photon kit. Two to communicate between. Comes with Photon kit to power device. Keep in mind that there needs to be a power source connected to this, such as a wall outlet or a computer. This is our IOT project that was assigned from our Instrumentation class at UNCC for the Spring 2017 semester. The purpose of our project was to tell when a room reached a specific temperature, which will cause another particle photon to turn on the D7 LED. Since the summer is coming around the corner, we will be able to tell if a room or a car is too hot. This will allow us to better prepare ourselves for the heat. To change it up for the cooler weather. These commands can be changed in the code to cause the D7 LED to light up when it gets too cold instead of causing the D7 LED to light up when the temperature is too hot. This can be achieved by simply changing the parameters in the particle subscribe code or by changing the Digital Write toggle commands. These commands will allow us to tell if a room or car has gotten too cold, and this will let us know if we need to bundle up to stay warm. 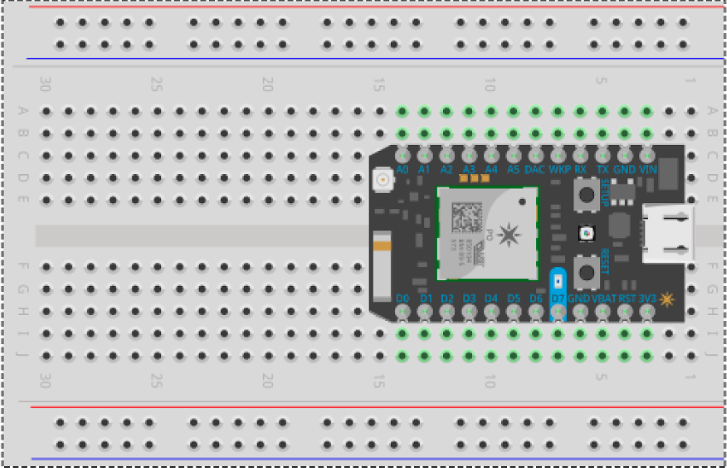 The breadboard below shows the wiring for the temperature sensor (DHT 22) and the particle photon. The temperature and humidity data are published into the cloud, which will then be picked up by the subscriber. The breadboard shown below will act as the particle photon subscriber. This is the photon particle that retrieves temperature data from the cloud and will either Toggle Digital Write HIGH, if the temperature is greater than or equal to 20 degrees Celsius, or toggle a Digital Write LOW, if the temperature is less than or equal to 19 degrees Celsius. When it triggers the Digital Write HIGH, the D7 LED will light up. When it triggers the Digital Write LOW, the D7 LED will turn off or it won't light up at all. Below shows the sample graph data that displays the Time vs Temperature, Time vs Humidity, and Light vs Humidity retrieved from the IFTTT and google docs programs. This video shows the process of how our IOT temperature project works. It shows the communication between the two photons. This is the breadboard wiring for the temperature sensor. The temperature and humidity data is published into the cloud, which will then be picked up by the subscriber. This is the photon particle that retrieve temperature data from the cloud and will either Toggle Digital Write HIGH if the temperature is greater than or equal to 20 degrees Celcius or Toggle a Digital Write LOW if the temperature is less than or equal to 19 degrees Celcius. 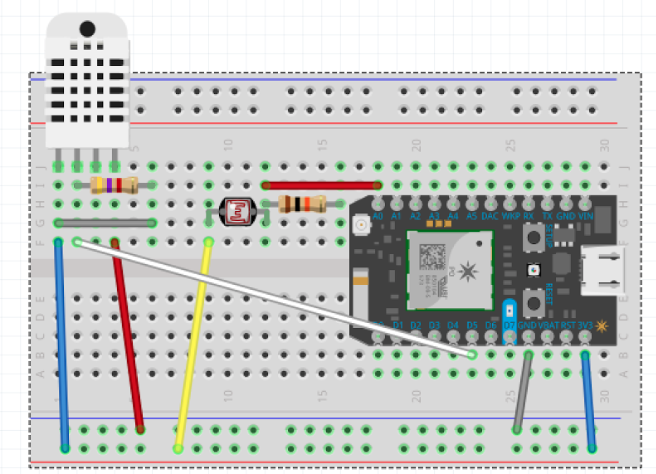 This code is used for the breadboard with a temperature sensor on it. The temperature, humidity, and light data retrieved from the DHT 22 will show up on the particle console and these data are published into the cloud. This is the code that is used for the photon subscribe breadboard, where the data is retrieved from the cloud and the D7 LED either turns on/off based on the temperature parameters of digital write toggle commands. //The relay is wired as normally closed and is non-latching so that if the photon loses power the light will remain on, setting the pin value to high defaults the light to the off position by opening the relay circuit. //Converts this new string "pew" into the previously defined integer "temperature"